I recently came across this token amongst my possessions. I had forgotten about it and I’m not quite sure where it came from. It has nothing to do with my early life although similar items may well have done. Well, it is clear what it is (I hope). 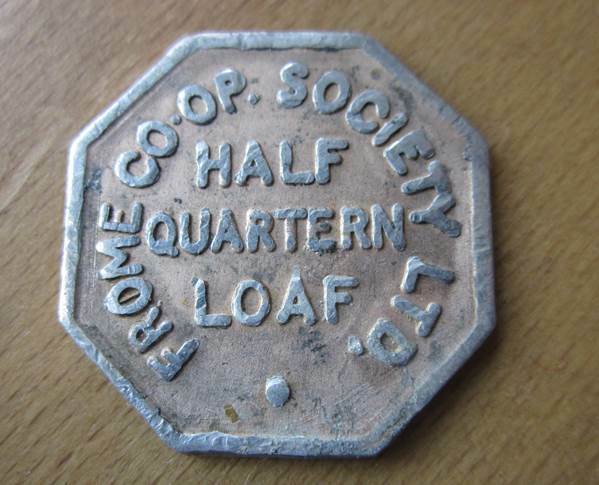 It’s a trade token issued by the Frome C0-0p Society Ltd and its value is a half quarter loaf. Its size is similar to the present British 50p coin (that only has seven sides). Frome (it’s pronounced froom) is in Somerset some 25 kilometres in a straight line from where I now live and about 150 kilometres from my childhood home. I can’t find out much about the Frome Co-operative Society but a half quarten loaf is what we now call a large loaf. When I was a child, I seem to remember our local co-op bakery van calling and I’m sure my mum had tokens for bread. In my mind they were round and not octagonal like this Frome one. I was never quite sure what the advantage was of tokens. Perhaps, with their specific purpose they were deemed less likely to be stolen if left out for the baker.